​Do you want to build confidence around speaking truth to others? Do you feel blocked or dormant in your true voice? Would you like to have a deeper connection to your sound and chanting mantra? 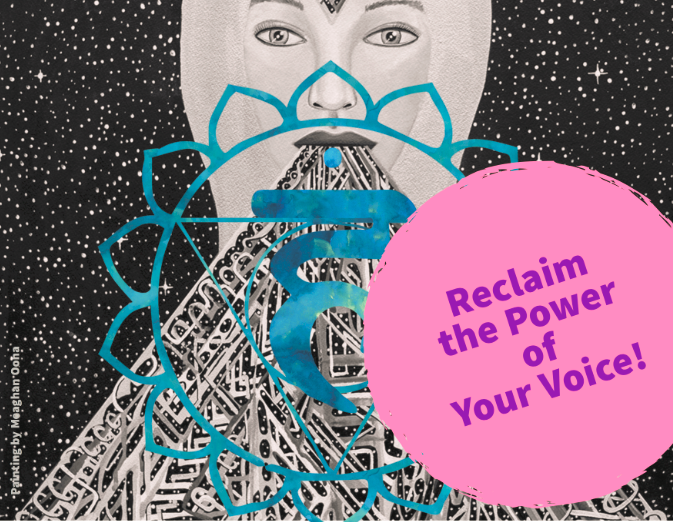 Would you explore the energetic field of Vishudda, the throat chakra? "One of the most powerful forces on the planet is at the tip of our tongue, Sound!" (Simrit, 2018). Each of us, as human, possess a supreme and/or the ultimate power of sound. The human sound can be accessed to heal and transform 'samskara' or what are subtle impressions of past actions. Sounding may be expressed as chanting, singing, speaking or very simply making sounds. The keys to unlocking what is your true nature in sound lie in the chakras, and most importantly the intention. In the safe and sacred space of Soul Center, we will explore techniques that done consistently will begin to strengthen the 'muscle' of confidence. We will draw the Life Force energy to Vishudda, use mantra to clear and transmute stagnant energy into radiance. We will explore and practice specific vocal asanas to prepare the vocal chords (folds) to chant mantra. You will take away specific exercises that may be practiced daily with already developed rituals. You will be introduced to mantras that you can easily drop into whenever or where ever you are to center and ground the body/mind. More importantly, we hope to open and shift perspective on sound, YOUR own sweet sound, that is unique to you, your Sovereign Sound! Please email me with any questions, or call. I am so thrilled to bring this gift to you!